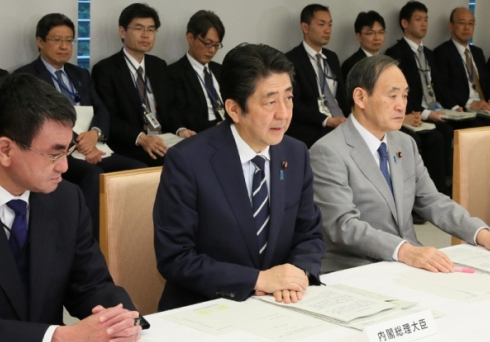 TOKYO — Prime Minister Shinzo Abe on April 25 held the 16th meeting of the Emergency Response Headquarters for the Earthquake Centered in the Kumamoto Region of Kumamoto Prefecture 2016 at the Prime Minister’s Office. At the meeting, reports and discussions were held on the situation pertaining to damage and the response of each ministry and agency. “Two days ago, I was heartened to see the search workers in Minamiaso Village, who were strongly determined to find the people with whom contact still cannot be made. While earthquakes still rock the affected areas and the weather is unstable, I would like the workers to continue to exert effort into the search activities while paying due care to secondary disasters. “Today, a Cabinet decision was adopted to designate this earthquake as a ‘Disaster of Extreme Severity.’* This will allow special financial support measures to be taken for restoring public works facilities, such as roads and rivers, as well as farmlands and schools. I am resolutely committed to providing financial support, including through the establishment of a supplementary budget, to ensure that the restoration process proceeds as quickly as possible and the industries of the affected areas are recovered. “A total of around 6,000 volunteers from around the country have gone to the affected areas. They are supporting the affected people by leveraging their respective strengths through separating and transporting relief goods, helping with the cleanup of affected houses, providing nursing care assistance, and more. I would like to express my deepest appreciation to the volunteers. “It is pressing that the affected people relocate from evacuation centers and their vehicles to safe ‘housing’ as quickly as possible. Top priority needs to be given to tasks such as assessing the damage of affected houses and issuing disaster victim certificates. To speed up these procedures, national government personnel will be mobilized, and I request local governments nationwide to dispatch additional personnel who are knowledgeable about these tasks. By holistically mobilizing manpower, I will ensure that full support is provided so that these certificates are issued as quickly as possible. “At the same time, we need to press ahead with the building of temporary housing. Today, I dispatched to the affected areas, personnel who were involved with the construction of temporary housing after the Great East Japan Earthquake in order to support the work of the affected municipalities. The acceptance of residents for public housing and the selection of sites have already begun. The personnel will work with the affected municipalities to accelerate the efforts to start the construction work as soon as possible. *A disaster that is recognized as having a significant impact on the national economy and which requires the implementation of special subsidy measures to alleviate the burden caused by the disaster on local finances and on persons affected. Once a disaster has received this designation, special financial subsidy measures are put in place, including the raising of national subsidies for disaster reconstruction projects to be implemented by local public bodies and special guarantees for small- and medium-sized enterprises.